Identity development has been studied from a variety of perspectives within social and developmental psychology, with positive psychology most recently adding to this literature. Finding and moving forward with a unified sense of self has been the primary focus. This search embodies the different social contexts to which we belong—in other words, our group affiliations. Although religion is one factor that provides a sense of belonging and purpose to many people, the development of a religious identity has not been explored as much as other social identities. In this chapter, we begin by providing an overview of Islam and wellbeing, including a mapping of the VIA Classification of Strengths and Virtues to verses from the Quran that form the basis of a framework of Islamic virtues. We review frameworks of identity development, including stages of the development of faith. 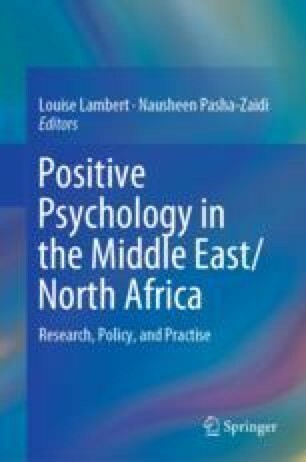 We also look at the link between religious identity and wellbeing and provide a proposed model of religious identity development for what we term, a “Positive Islamic Identity”. Chouhoud, Y. (2018). What causes Muslims to doubt Islam? A quantitative analysis. Dallas, TX: Al-Yaqeen Institute. Retrieved from https://yaqeeninstitute.org/en/youssef-chouhoud/what-causes-muslims-to-doubt-islam-a-quantitative-analysis/. Ibrahim, M. H. (2016). Religion and wellbeing: Differences by identity and practice (Psychology Honors Project). Macalester College, St. Paul, MN. Retrieved from http://digitalcommons.macalester.edu/cgi/viewcontent.cgi?article=1039&context=psychology_honors. Neiwert, D., Ankrom, D., Kaplan, E., & Pham, S. (2017). Homegrown terror. Reveal from the Center for Investigative Reporting. Retrieved from https://apps.revealnews.org/homegrown-terror/. Roser, M., Nagdy, M., & Ritchie, H. (2018). Terrorism. Our World in Data, Oxford Martin Programme on Global Development, University of Oxford. Retrieved from https://ourworldindata.org/terrorism. Temple-Raston, D. (2018). The female Quran experts fighting radical Islam in Morocco. The Atlantic. Retrieved from https://www.theatlantic.com/international/archive/2018/02/the-female-quran-experts-fighting-radical-islam-in-morocco/551996/. US Department of Justice. (2005). Terrorism 2002–2005. Federal Bureau of Investigation Counterterrorism Division. Retrieved from https://www.fbi.gov/stats-services/publications/terrorism-2002-2005. Wike, R., Stokes, B., & Simmons, K. (2016). Europeans fear wave of refugees will mean more terrorism, fewer jobs. Pew Research Center, 11. Retrieved from http://www.pewglobal.org/2016/07/11/europeans-fear-wave-of-refugees-will-mean-more-terrorism-fewer-jobs/.